A grandmother who thought her hot flushes, niggling back pain and swelling in her stomach was a sign of the menopause had the shock of her life when it turned out she was in fact pregnant. Mandy Davidson, a mother of two children in their 20s, today told of her shock and delight at giving birth to her surprise baby, healthy 8lb 1oz Alfie. Mrs Davidson, 45, from Caister, near Great Yarmouth, had no idea that she was pregnant with Alfie until the back pain she had been suffering for a number of weeks suddenly became unbearable during a lunch break on Wednesday, March 28. 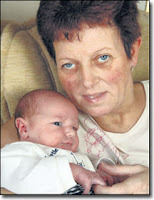 She was taken to the James Paget Hospital - and five hours later had given birth. Now back at home with Alfie and Kevin, her husband of 26 years, the new mum said: "I am totally delighted. "He's really, really placid - really good. Alfie was a placid baby both inside and out of the womb. "When he was inside, I felt ripple-like sensations but nothing like a kick to give it away." Mrs Davidson, who has two grown up children, Victoria, aged 25, and Philip, 26, as well as a seven-year-old grandson. Owen, had refused to worry about the flushes, back pain, and bloated sensation that she had been feeling prior to Alfie's arrival. She continued to work as a nursery worker at Seagulls, in Gorleston, and at Smart Kids, a centre for autistic children, after a check on the internet. The information that she found there appeared to confirm her suspicions that the symptoms she was suffering were those of the start of the menopause and she did not think it necessary to seek the advice of a doctor. But after the pain increased at work last week, Mrs Davidson finally realised that she might be pregnant after all. Mrs Davidson said: "I recognised the signs of labour when the backache turned into much more than that - that's when I knew I was expecting. "We went straight to the hospital and Alfie was born at 6.25pm. They think I was 40 weeks and he had been lying across me with his head down." Mrs Davidson, who is also a Brownie and Girl Guide leader, said that she had not put on much weight over the nine months of her pregnancy. But she added: "I turned out I was carrying a lot of water and lost a stone and a half immediately after birth." Alfie's surprise arrival also came as a shock for husband Kevin, a 48-year-old welder. He said: "I nearly fell to the floor when I found out. It was even more of a shock when the hospital midwives told us at first that it was twins!" The couple's third child, Harriet, tragically died aged two-and-a-half from diabetes.